Lunchtime for the four chicks! The last egg has hatched! After a long and anxious wait the final chick has hatched! It hatched at just before 1pm on the 27/04/17, all four chicks are feeding well and all look healthy. There have been some amazing feeding scenes over the past few days with plenty of food being brought in; sometimes two pigeons at a time! Mrs P and Archie have been doing an amazing job at keeping the chicks warm during the recent cold snap. 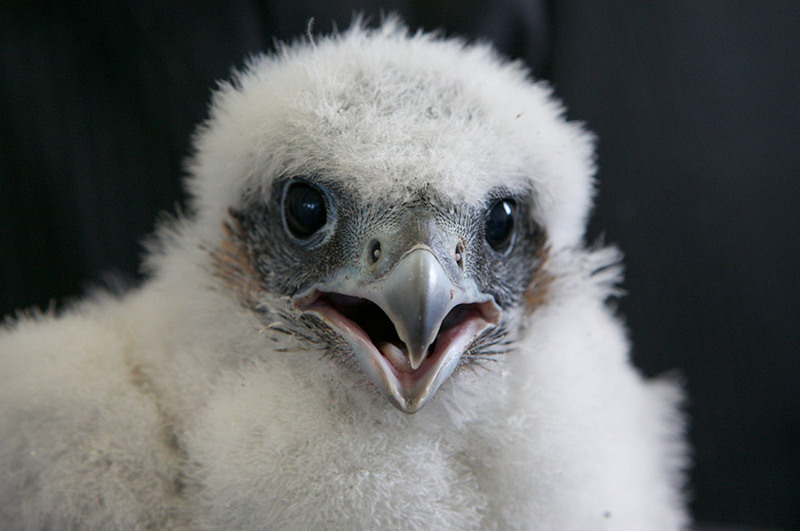 For around the next six weeks the chicks will rapidly grow in size, losing their downy white feathers and gaining their juvenile feathers. Once six weeks is up the chicks will have their first attempts at flight, after this the then fledglings will still be dependent on Archie and Mrs P for around four weeks before they completely leave the nest.